Truly one of a kind Deluxe Condominium, this is a hidden jewel of the building. Besides being direct Oceanfront, it has a PRIVATE ROOF TOP LANAI (360 square feet) that has views that don't stop!! Spectacular!! It will WOW you!!! Our condo is located on the 2nd floor, SOUTH CORNER unit. This is the Extra bonus that you get renting this unit, the only unit on the south end of the building that has this Roof top deck, it is worth the extra few dollars to rent. We listen to our guests, and we have completed our new tile floor thru out, and fresh paint too!! it is like new again... For your added enjoyment, relax with the 38 inch flat screen TV, DVD Blue Ray player, and Sony I-Home Stereo Docking Station. (i-pod, i-pad, i-phone) We also have secure 'WiFi' in the condo as a extra service for our guests. Expecting company? No worries, we have a full sized sofa sleeper bed. As requested, we have replaced the sofa bed mattress with a Deluxe 5 inch Memory Foam cool gel mattress. The large bedroom features a King Size Bed with bedside tables and a large built-in closet. Stay cool in the bedroom with the ceiling fan and put your feet up as you take in a spectacular view of the West Maui Mountains. We have installed a In-Room SAFE for your use while visiting. There is also a window that allows for the trade winds to blow thru the unit if you perfer over the air conditioning. This unit also features a modern updated bathroom with a window (it too opens for the fresh breeze), a enclosed shower and granite vanity. If you are a home body, the Pool Cabana area is perfect for you. The pool is heated and the Hot Tub has the best jets for your relaxing and soaking. The hours are from 9AM - 10PM daily. There are gas grills and nice covered dining area for all guests use. While waiting for your grill to heat up, there is a dart board to fill the time. The cabana has a full sized community kitchen that is always available. Inside is also a ping pong table, and there are both men and women restrooms at the pool side. The State of Hawaii and Maui Kai AOAO has strict No Smoking Rules, and have set up a lovely Designated Smoking area for any one who feels the need to smoke. See our photos, it is located on the north end of the building off the parking lot, you can't miss it. And another treat for our guests is the Large Community Herb and Vegtable Garden!! You just never know when you you need fresh Basil or Rosemary!!! Shops, grocery stores, restaurants, Outdoor Farmer's Market, and cafes are only a few blocks way. You can walk on the new beach walk, or drive. And if you like to golf, you are only a short driving distance from 3 world class golf courses. 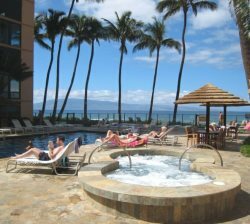 Lahaina town is a quick 8 - 10 minute drive south from the condo. Air-conditioned, free parking, this is a real oceanfront treasure! We stock some beach gear for you,( no snorkels- you can rent equipment across the street) so just bring a good book, and your self, this is your paradise!!! THIS IS A NON SMOKING CONDO UNIT, NO PETS ALLOWED. MAXIMUM PERSON IN THE COND UNIT IS 4 IN TOTAL, including children and infants. ALL GUESTS NEED TO REMOVE THEIR GARBAGE DAILY IN THE WASTE CHUTE IN THE LAUNDRY ROOM, NEXT TO ELEVATOR.